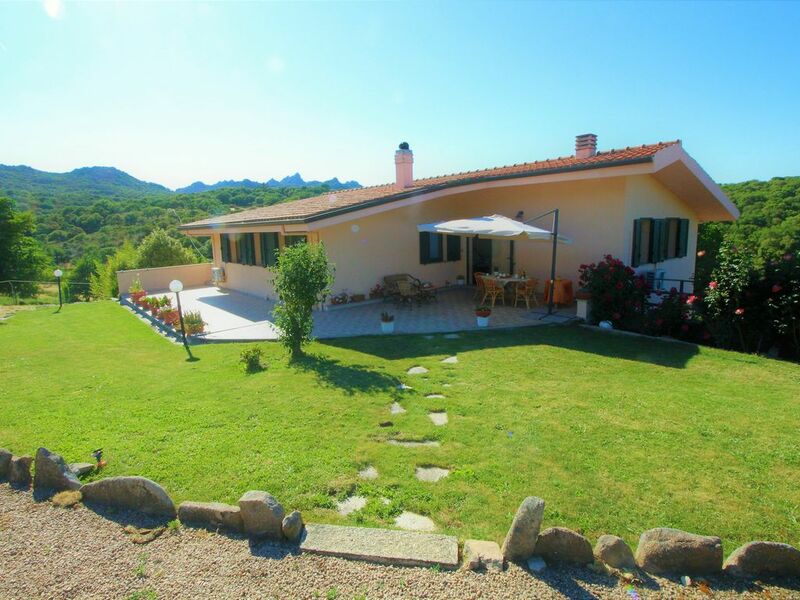 Comfortable house situated in the hills of Tempio, the small town at the foot of Mount Limbara. Access to the house, making crossing a lawn that opens on a bright living area, consists of kitchen with dining room with direct access to the beautiful back porch that overlooks the surrounding forest, ideal for reading or just enjoy a coffee in total relaxation, and three spacious double bedrooms, one quadruple, consisting of two rooms connected by a sliding door and three full-service. The property also features a convenient laundry room; All rooms are equipped with TV with satellite channels. Because of its strategic position between sea and mountains, Sirena villa allows you to enjoy the most of the delights of this beautiful region. Fabrizio de Andrè, noted Genovese singer-songwriter, who settled in Tempio, Sardinia said "Life in Sardinia is perhaps the best a man can hope: twenty-four thousand kilometers of forests, campaigns, coasts surrounded by a miraculous sea should be what I suggest God to give us as Paradise. " We were given a nice welcome from Franca and Augustino, a lovely couple. The gardens around the villa are beautiful, the location is attractively rural, goat bells and bird song are the only sounds. The villa is huge, the good quality and very quiet air conditioning in each room is very welcome when it is hot. outside. The nearest town is Aggius and is charming with the local shops providing everything you could need. We'll be back! Salve Susanna, grazie per la stupenda recensione. Dai noi sarai sempre gradita ospite. 2 Wochen in der ruhigen Lage in den Bergen zwischen Tempio Pausiana und Aggius haben uns sehr gut getan. Das preiswerte geräumige Quartier ist ein idealer Ausgangspunkt für die Erkundung der Nordhälfte der Insel, jeweils 1 Std. nach Olbia oder Alghero und 30 min bis zur Küste. Das Haus ist auch bei Hitze gut temperiert, der Balkon nach Westen und die Terrassen nach Osten / Süden ermöglichen die Wahl zwischen Sonne und Schatten. Nachts ist hier ein toller Sternenhimmel mit Milchstraße poor, es gibt keine Lichtkonkurrenz. Die Zimmer und das ganze riesige Grundstück sind sehr gepflegt. Die Gastgeber sind morgends und Abends am Haus, um die Ziegen und Schafe zu versorgen, das ruhige Geläut der Glocken entspannt. Agostino spendierte Obst und Gemüse aus dem Garten. Für Naturliebhaber, gleich ob Paare oder Familien, ein idealer Ferienort. Wij werden heel fijn verwelkomd door het echtpaar. Het huis is prima, lekker koel in de juli zomer en er is airco aanwezig. Het kijkt uit op een prachtig panorama. Wij konden naast ontspannen en genieten ook prima tochten maken door heel Noord-Sardinië. In de het contact met de eigenaren kregen we onverwacht een mooie krop sla uit eigen tuin en zelf gekweekte aardappelen, die smaakten prima! Met andere woorden een prima verblijfplaats waar je je snel op je gemak zult voelen. nous avons passé une petite semaine dans cette maison. les propriétaires sont deux personnes vraiment sympathiques. ils ont été super avec notre petit garçon. la maison a une superbe vue et est dans un endroit super calme. Salve Stèphanie, grazie della bella recensione, la mia casa per voi sarà sempre aperta, un saluto e un abbraccio. Sehr schönes Haus in einer sehr idyllischen Lage gemäss den Bildern. Sehr nette Vermieter, welche nur italienisch sprechen, aber die Verständigung klappt trotzdem sehr gut. Salve Andreas, la ringrazio per la gentilezza e correttezza, spero di riavervi come ospiti. Comfortable house situated in the hills of Tempio, the small town at the foot of Mount Limbara. Access to the house, making crossing a lawn that opens on a bright living area, consists of kitchen with dining room with direct access to the beautiful back porch, overlooking the surrounding woods, ideal for reading or just enjoy a coffee in total relaxation, and three spacious double bedrooms, one quadruple, consisting of two rooms linked by a sliding door and three full-service. The property also features a convenient laundry room. All rooms are equipped with TV with satellite channels. Because of its strategic position between sea and mountains, Sirena villa allows you to enjoy the most of the delights of this beautiful region. not far from all the beautiful beaches of Gallura such as Porto Cervo in Santa Teresa to 'Red Island. Alternatively, you can visit the famous woods of Mediterranean scrub that extend throughout the area, known for their scents and colors with long walks on foot or horseback or visit the remains of the mighty and mysterious civilization Nuragica, in the area . The massif of Mount Limbara also lends itself to biking or motorcycle tours, hiking on foot or on horseback. For fans, you can also use the services of the nearby Azienda Agrituristico Hunting for the practice of the ancient and noble art of hunting, and the tasting of delicious local dishes, expertly prepared.